Experts from different fields have conducted extensive research on knowledge acquisition and retention. Learning reinforcement is an aspect all eLearning professionals are striving to achieve. 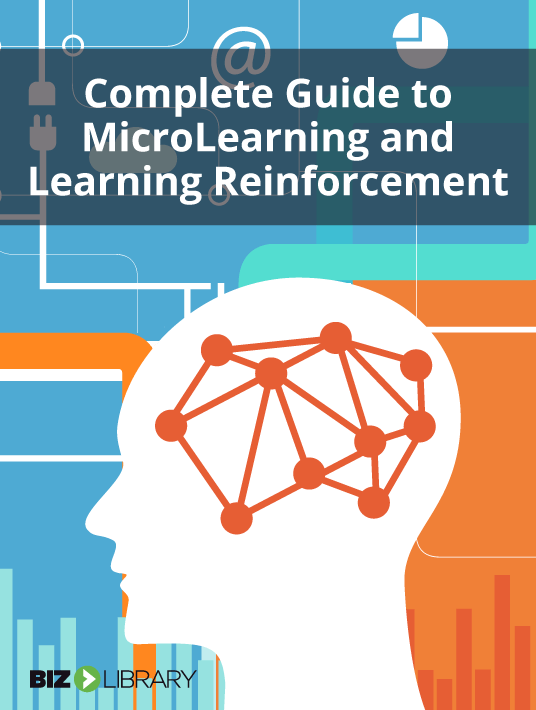 The free eBook Complete Guide To MicroLearning And Learning Reinforcement demonstrates how microlearning can be the answer you were seeking to deal with your online learners’ difficulty to acquire and retain knowledge. BizLibrary provides both the theoretical as well as the practical aspect of the subject at hand. The eBook constitutes a well-substantiated piece of research. The first chapter of the eBook highlights the prominent role objectives hold in an online training program. BizLibrary uses statistics that indicate how a great part of the budget for online training goes to waste. They attribute that to knowledge that's forgotten shortly after it is acquired. The importance of having clear eLearning objectives becomes prevalent in such a context. This way, unnecessary investments are not made. As a result, online learners do not acquire knowledge temporarily, but in a more permanent manner. The Complete Guide To MicroLearning And Learning Reinforcement continues by analyzing the theory of the German psychologist Hermann Ebbinghaus regarding the Forgetting Curve. Research conducted helps better comprehend how the brain works, how it stores information and what information it decides to discard. The third chapter is dedicated to how difficult it can be in today’s corporate world to train employees. BizLibrary, utilizing a study by Bersin by Deloitte, demonstrates how different challenges such as distractions or huge workload influence employees and to what extent. Science can be used in almost every field to achieve certain goals. The free eBook by BizLibrary uses examples from two industries in the fourth chapter, namely sports and architecture, to demonstrate how science can provide the background that leads to desired outcomes. The hint here is more than obvious; science should be applied in the attempt to reinforce learning. The fifth chapter of The Complete Guide To MicroLearning And Learning Reinforcement enriches the theoretical analysis provided in the previous chapters by elaborating on the way people learn. The chapter addresses critical aspects of learning such as consolidation and retrieval, and what role they have in knowledge acquisition and retention. Much like the previous chapter addressed facts about the way people learn, the sixth chapter presents common myths about learning. This significantly enhances the validity of the arguments posed by BizLibrary. Misconceptions such as “Forgetting is the failure of memory” and “If the information is relevant, I will remember it” are refuted in this chapter. Eduardo Salas, a professor at Florida State University, has devoted a lot of time studying corporate training programs. In the seventh chapter of the eBook Complete Guide To MicroLearning And Learning Reinforcement, BizLibrary uses Salas’ words on the role science plays in corporate training to further strengthen the view supported. The findings of his research are quite surprising. Companies do not use science to better understand learning and improve their training programs. The next chapter of BizLibrary’s eBook presents surefire science-based ways companies can use to improve an employee training program. In this chapter, basic microlearning and learning reinforcement concepts are presented, such as content chunking, spaced repetition, learner testing and mixing up of activities to improve different skills. The chapter also highlights the importance of creating activities that are challenging as well as how writing can help us organize information in our minds in a more effective way. The final chapter of the free eBook Complete Guide To MicroLearning And Learning Reinforcement analyzes how the stage prior to the beginning of the training program is equally important. It elaborates on techniques such as Priming that get learners engaged even before the program has actually started. Effective learning is difficult to achieve. Knowledge acquisition and retention are the main objectives of every training program. BizLibrary designed the ultimate guide on how to reinforce learning through microlearning, utilizing both a theoretical and practical framework to support the view presented.